The Baker Family performs at the 20th Annual Gospel-Bluegrass Festival at Salmon Lake Park on Friday, May 26. Photo by Cody Thompson/ Messenger. 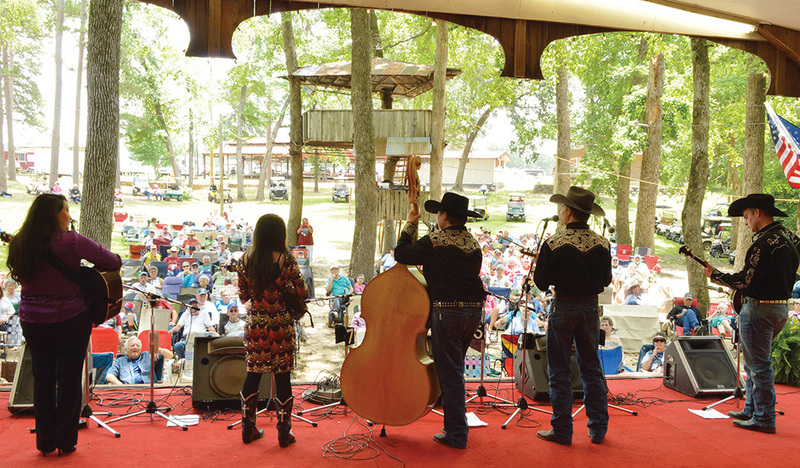 GRAPELAND – The 20th Memorial Day Weekend Gospel-Bluegrass Festival is underway and throngs of people have gathered to listen to the old-timey music and fellowship with one another. This year’s festival, sponsored by the Texas Bluegrass Music Association, features bands and artists from across the country, including, but not limited to: The Baker Family, The Marksmen and The Purple Hulls. The festival kicked off on Thursday, May 25 and by Friday, May 26 the RV park was filled with people from across the state. Avid bluegrass enthusiast Eddie Ammons, of Needville, has traversed the country, going from one bluegrass festival to another and claims the SLP bluegrass festival is one of his favorites. Fellow Needville resident, Dorothy Lipinski, was convinced to come to the festival by Ammons in 2014 and has been a regular ever since. Some of the patrons of the festival not only come to hear the music, but to play it as well. Performers and guests can be found in the building labeled “City Hall,” located near the main stage, making music together. Lem Billick, of Temple, states that he loves to hear the bands play on stage, but the reason he keeps coming back are the “jam” sessions. Billick has been coming to the festival for approximately 12 years and has played with so many people that many don’t know his name but know him by his festival nickname, “The man with the green guitar,” according to Billick. The festival continues throughout the weekend with performances by Bama Blue-Grace, The Baker Family, Catahoula Drive, Shallow Creek, The Purple Hulls and the Marksmen on Saturday from 1 p.m. to 10:30 p.m. on Saturday, May 27, as well as performances by Paul’s Journey Shallow Creek, Robertson County Line, Catahoula Drive, The Purple Hulls and The Marksmen from 1 p.m. to 5:30 p.m. on Sunday, May 28. For more information about the festival, visit www.salmonlakepark.com.